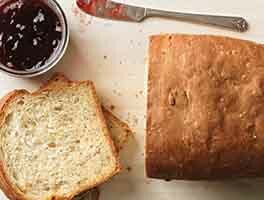 This signature white sandwich loaf, an updated version of King Arthur's popular Walter Sands Basic White Bread, is the "go-to" bread for breakfast toast, brown-bag PB & Js, or a grilled-cheese-and-soup supper for many of us here at King Arthur Flour. Just like King Arthur Flour itself, this bread is classic, reliable, and your best friend in the kitchen. And who was Walter Sands? The Sands family became associated with King Arthur Flour in 1820, 30 years after the company's founding. Walter headed up the company from 1943 to 1968, when his son, Frank, took over as president. Frank led an effort that made King Arthur a national brand by the turn of the 21st century; several years ago he and his wife, Brinna, sold the company to us, the employee-owners. Frank and Brinna are still the inspiration behind King Arthur's long-time quest: to serve our community, do the right thing, and provide Americans with the best flour in the world. We honor their legacy with this bread. Gently deflate the dough, and shape it into a fat 9" log. Place it in a lightly greased 9" x 5" or 10" x 5" loaf pan. We call for a fairly wide range of water here due to two variables: how bakers measure their flour, and climate/season. Flour is drier and will absorb more liquid in winter, and/or in a dry climate; in summer or in a humid climate, it's moister and will absorb less. 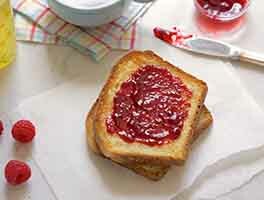 So generally speaking, you'll use more liquid in your bread in winter, less in summer. In addition, some bakers measure their flour by dipping the cup into the bag or canister, tapping the flour to pack it down, and leveling it off. The way we measure flour here at King Arthur Flour is to stir/aerate the flour, sprinkle it gently into the measuring cup, and level it off. If you're of the scoop/tap/level school, which measures a "heavier" cup of flour, you'll need to use more liquid. At any rate, for this recipe, start with a smaller amount of water and move up, if necessary; it's easier to add water than to take it out! Your goal is a dough that starts out a bit sticky, but as you knead becomes soft (but not sticky) and smooth, not "gnarly." 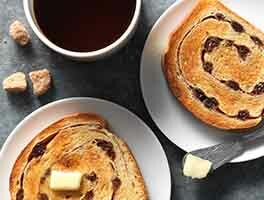 Want to make this bread using a bread machine? See our Walter Sands' Favorite Bread — Bread Machine Version. Delicious! Made as written and came out with a beautiful tasty loaf that the whole family enjoyed. Will make over and over! Used vegan butter and powdered coconut milk to make this dairy free. Excellent results! Will definitely make again. 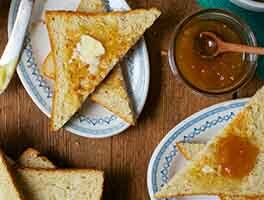 One of my favorite recipes especially for white bread. 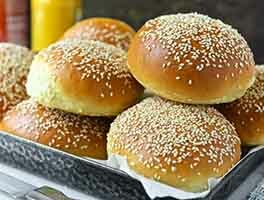 I have noticed a big difference in my bread if I have to use a different brand from KAF. I do have a question, though. I have started baking again since I got my diabetes under control. I have this recipe in its second rise. Since I hadn't baked in a while,I needed to prove my yeast using 1/4 cup water. I forgot to subtract that amount from my recipe water, just thinking it was gooey because of the weather! Then realized my mistake. What can I expect? I will go ahead and bake this but will it be weird? I am far from a novice - been baking since the day after my wedding 12/23/1973 when we took some of our wedding money and I bought a bread book and a biscuit cutter at Christmas Eve shopping! Will it seem undercooked, crumbly or what? Made this two days ago, subbing half the KA Organic Unbleached AP Flour for KA Organic Bread flour & used the max water suggested (it's still very cool here). The bread rose beautifully, was tender and delicious. Question: after the first day, it was very fragile and hard to slice thin enough for sandwiches--it tended to break apart. Any suggestions? Should I slice the entire loaf after it's fully cooled, then store in freezer in heavy plastic bag? Also, could I make sandwich rolls from this recipe? What changes would you recommend? Thanks! This is my weekly sandwich bread recipe and it is always successful. I decided to try the tangzhong method to see if it will stay fresher longer. I used 115 grams of water and 25 grams of flour for my slurry, then used 246 grams of water and 457 grams of flour to finish the dough. Wow! It rose higher than ever before. It was soft and pillowy. Can't wait to see how long it stays fresh in my bread box. This makes a great loaf of sandwich bread, really firm and large. I think this will be our new staple. I suggest the following changes, though: - Do a third rise overnight in the fridge, and then cook for 35 minutes in a preheated oven - Substitute out a cup of white flour for wheat (more would probably be fine) - I used Crisco instead of butter and replaced half the butter with molasses - Double everything (except for the yeast) and bake in 8.5" x 4.5" pans I did the third rise by mistake: I forgot about it during the second rise until just before bed, and so I punched it down and re-rolled it out and put in the fridge overnight. In the morning it was perfect, but needed more cooking time. I have only liquid milk and active dry yeast on hand. What adjustments to the recipe should I make? Easy recipe with a great outcome. 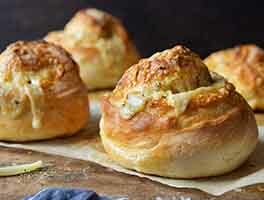 I would highly recommended this recipe especially if you haven't made bread before. I've been working on perfecting my technique with this recipe, and yesterday's loaf was a winner! Soft, airy - great texture, and perfect for sandwiches. Truly delicious -- can't wait to take it to work on Monday! I used the full amount of water, kneaded by hand until the dough is really smooth. On the second rising (in the loaf pan), the loaf was ready in under 60 minutes -- so I would recommend checking at the 45 minute mark to avoid over-proofing. I've been baking this recipe for at least three years now. I was an absolute beginner when I first tried it. I would run from the kitchen to the PC in the den and check the blog for reassurance and right from the get-go I have had nothing but success with this bread. Recently, I started using part KAF White Whole Wheat in addition to the AP and was very happy with the results. This month I discovered Sprouted Wheat and used the Easy Rustic Bread recipe but although I loved the flavor, I wasn't thrilled with my loaf. Last night I made the Classic with 1/4 of the flour being Sprouted Wheat and I have a beautiful loaf that tastes terrific!